Sikkim Police arrested four persons from Gangtok on Friday in an alleged case of extortion on the written complaint filed by a contractor Thupden Thinley Bhutia. Sikkim Krantikari Morcha, on Saturday, accused ruling Sikkim Democratic Front of hatching conspiracy to defame the party due to SKM’s increased popularity among the masses. To buttress its claims, the party cited the arrest of four SKM members from Gangtok by police on Friday. Sikkim Police arrested four persons from Gangtok on Friday in an alleged case of extortion on the written complaint filed by a contractor Thupden Thinley Bhutia of Gangtok at Sadar Thana on November 15. Those arrested have been identified as Kunchok Rapden Bhutia, Tenzing Dorjee Bhutia, Amen Mothey and Pema Samdup Bhutia. They were produced before the court on Saturday and released on bail. It is learnt that the contractor filed a three-page FIR complaining that the youths had demanded Rs 10 lakh from him as cut money for ongoing widening of Kazi Road on Thursday evening and threatened to obstruct the ongoing works if he fails to pay the money. 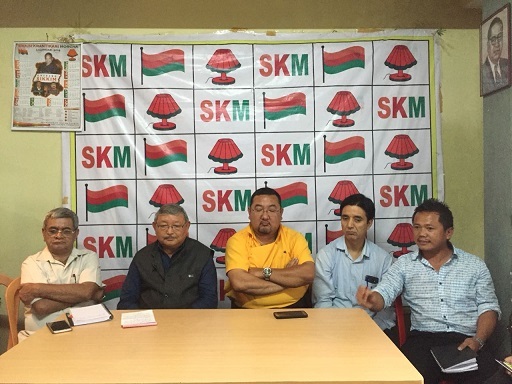 Addressing a press conference, SKM spokesperson Jacob Khaling said that the youths arrested by the police were the sincere and dedicated members of SKM party from Gangtok. “By seeing the honesty, sincerity and works of these youths, the ruling SDF party has tried to defame them and SKM party hatching a conspiracy,” he said. He has strongly criticised and condemned the attempt of the ruling party to defame SKM and its youths. Khaling alleged that the government had awarded the contract of Rs 57.83 lakh for widening of Kazi Road without inviting any tender and thereby violated the PWD code and manual with job order on June 13 this year. Khaling alleged that to pay back this favour to the ruling government the contractor has made the false allegation of extortion against the SKM members. He said the contractor himself called Tenzing Dorjee Bhutia to meet him on November 14 and they went to a shop of the contractor in Lall Bazaar on November 15 to meet him. “We strongly condemn such act of the ruling party and I would like to request SDF to do the politics of policies and programmes and not to do political conspiracy to play with the future of youths,” Khaling said.